Unbolt your old seats and throw them in the trash because you will no longer need them. Put the seat cushion, backrest and armrest in place and bolt them on with the provided nuts, bolts and washers, It is that easy and you will need nothing. These are NOT covers ; but the complete seat as shown in the picture. These are made here in the USA and are not trying to retire on the profit, just trying to price them so everyone can afford them. 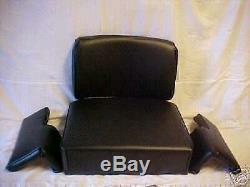 Seat Cushion replacemnt set for:John Deere Crawler. Set: Cushion, Backrest and Armrest. (These are not covers but the complete seat set as shown in the picture). Fits JOHN DEERE CRAWLER 350-450-550. Color: black and CUSTOM made in the USA. This will fit models: 350-450-550. Armrest part number are #18698. Please note these dimensions: the seat cushion is 21 " wide and 16 1/4" deep. The backrest is curved and is aprox. 13 tall and has 4 bolts on the back. 14 1/8 and have 4 bolts on the back side. Comes with: All NEW MOUNTING BOLTS, NUTS AND WASHERS TO ATTACH TO YOUR FRAME. The item "Seat Set For JOHN DEERE 350 CRAWLER, 350 DOZER seat" is in sale since Thursday, September 04, 2014. This item is in the category "Business & Industrial\Heavy Equipment Parts & Accs\Antique & Vintage Equip Parts". The seller is "bakt4kids" and is located in Wauseon, Ohio. This item can be shipped worldwide.